Vulkan Airxtend Back / Lumber Support Comfortable Fit. • With a tapered cut and flexible stays for firm lumbar support with a comfortable fit for both men and women. 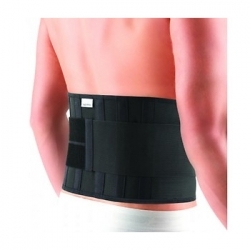 • Adjustable tension straps ensure a custom fit. • Recommended for back strains and sprains, moderate disc and arthritic conditions, sciatica, muscle spasms and strains of the sacroiliac area.